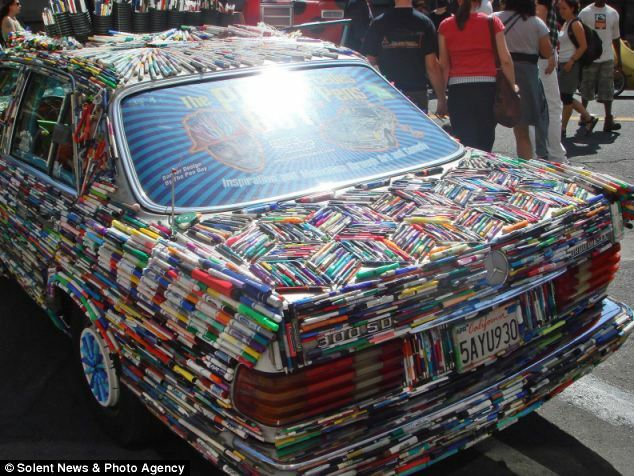 A graphic designer has come up with a novel way of using discarded pens instead of binning them: He sticks them to his car. 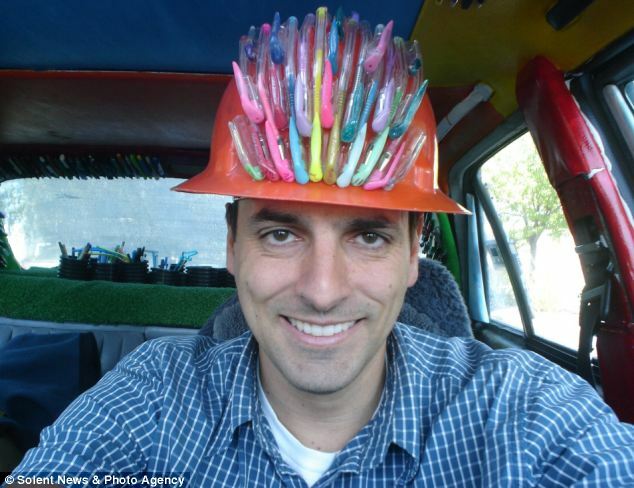 Costas Schuler has spent more than five years covering his treasured car in over 10,000 pens from around the world. 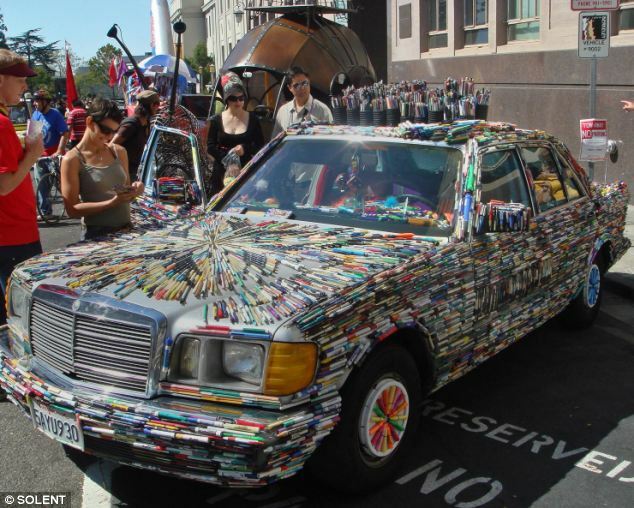 The designer, from Forestville, California, painstakingly glued the pens all over the inside and outside of his beloved 1981 300SD Mercedes Benz after collecting them from businesses, doctors’ surgeries, friends and family. The car has pens on its roof, dashboard and even the hub caps. He uses ball points, dry markers, dry erasers and any other discarded writing instrument. The father of four wanted to show people different purposes for discarded pens instead of billions of them being wasted each year going to landfill. His unusual hobby is the subject of a website with thousands of fans and has resulted in Costas receiving pens from around the world. 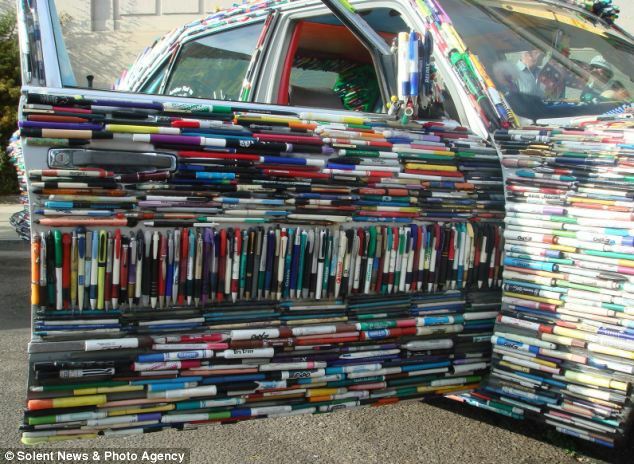 On one occasion, a group of orphan boys sent Costas used pens from Mozambique, in Africa, to stick on to the car. In return he sent them packs of new pens. Costas said: ‘A friend of my mine gave me the car in 2000 after my old one broke down. I found a book in the library about car art and was immediately fascinated by the art form. 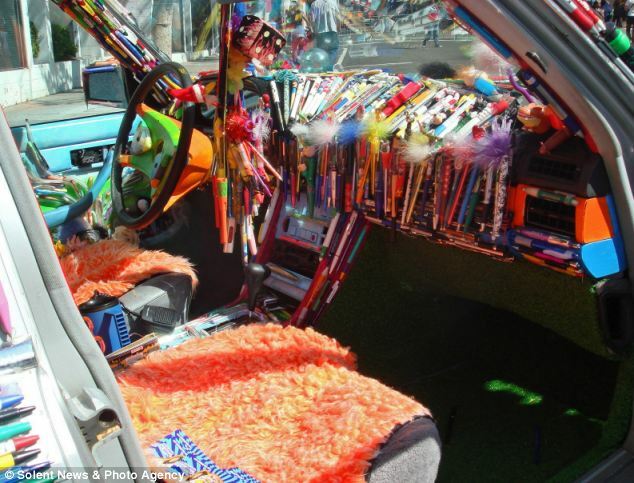 ‘I hatched an idea to make my own art car and then thought about completely covering it in pens. ‘Everyone uses pens and eventually they get stolen, lost or thrown away. So when I first started collecting them I had no problem asking, and people had no problem donating them for a crazy art project. ‘It took me five years of going around, setting up collection drops for pens and painstakingly sticking them to the car with silicon glue. ‘It’s my only form of transport and I use it every day. Most people stop and talk to me about it, it’s difficult getting out of a car park! ‘People wave at me when I drive by, honk their horns and light up with a big smile.’ Costas added: ‘I’ve had pens sent to me from all over the world, including Australia and England.